Tissues go undercover in a Sparkly Pony tissue box holder! It doesn’t matter how nice a pattern the tissue box has that you pluck off the supermarket shelf, there’s no denying it looks like a tissue box when you get it home. 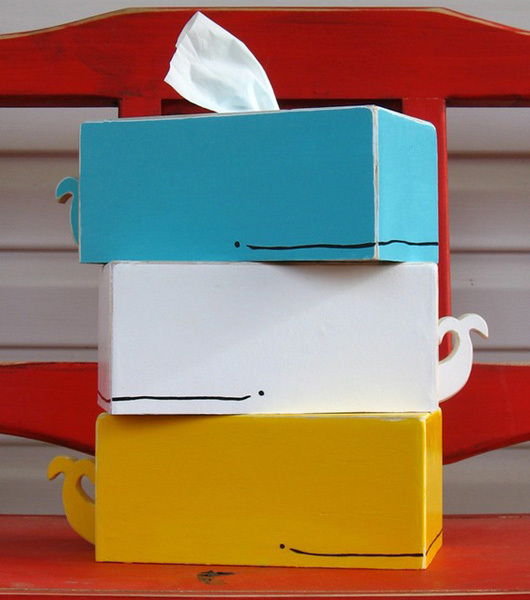 With this in mind, I love the idea of camouflaging the tissue box, especially with an elephant or a whale!Etsy store Sparkly Pony has created the very clever Animal Tissue Holder, a functional piece of art designed to conceal the tissue box. Almost ironically, it brings a whole lot more attention to the very tissues you’re attempting to hide… but in a good way. Sparkly Pony have an Elephant, a Whale and a Pony to choose from, in a rainbow of colours to suit your decor. Each Animal Tissue Holder is made from wood which is cut, constructed, sanded and painted all by hand, so you know you’re receiving a quality product! The Animal Tissue Holder looks as cute as can be and what small child can resist pulling on the pony tail next time they need to cover a sneeze? Animal Tissue Holders are priced US$39.99 and available from Sparkly Pony.